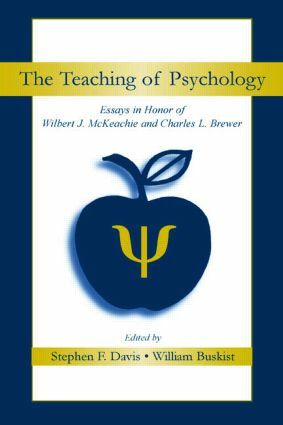 The Teaching of Psychology is centered around the masterful work of two champions of the teaching of psychology, Wilbert J. McKeachie and Charles L. Brewer, in order to recognize their seminal contributions to the teaching of the discipline. The book's main goal is to provide comprehensive coverage and analysis of the basic philosophies, current issues, and the basic skills related to effective teaching in psychology. It transcends the typical "nuts and bolts" type books and includes such topics as teaching at small colleges versus a major university, teaching and course portfolios, the scholarship of teaching, what to expect early in a teaching career, and lifelong learning. A closing section containing Bill McKeachie's and Charles L. Brewer's perspectives into the teaching of psychology and its history, highlights, and future. This book is intended for academic psychologists who teach and/or train graduate assistants to teach at the college and university level. All royalities from this book will be donated to the Society for the Teaching of Psychology (Division 2 of the American Psychological Association), which each year sponsors many activities across the country to promote the teaching of psychology. Wiring the Introductory Psychology Course: How Should We Harness the Internet? Reflections on an Academic Career: From Which Side of the Looking Glass?